UPDATE!!! During the weekend of 7/29-7/31/11, Blissful Bedrooms gave Melissa the Fairy Princess Garden bedroom of her dreams! More than 20 volunteers physically and creatively contributed to this act of love and compassion, and countless other individuals invested the funds in Melissa’s happiness to make it all possible. Melissa and her devoted mother now have a sanctuary of Melissa’s personal vision and design, their very own secret garden where they can escape from the challenges and rigors of daily life to feel rejuvenated, happy and peaceful. The serene and content smile Melissa wears on her face while lying on her bed at night conveys that her reality and dreams have lovingly collided and found the perfect compromise. 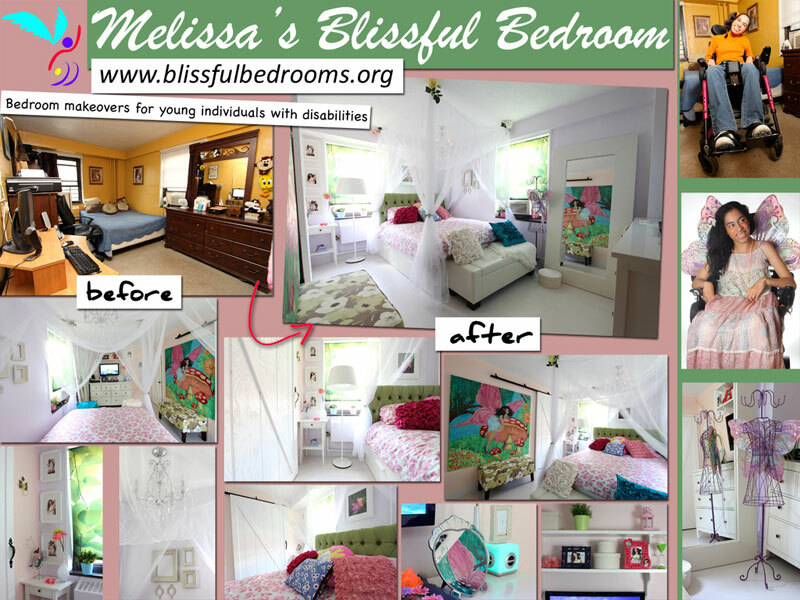 Blissful Bedrooms wishes Melissa and her mom much joy and love in their new bedroom! Melissa is an 18-year-old female who is sure to steal your heart with her purity and innocence, as well as her angelic face and fragile femininity. She currently attends a New York City Special Education school. Melissa is challenged with cerebral palsy, spastic quadriplegia type, which means that her arms and legs are affected. She is very articulate and speaks in a soft and breathy voice. Melissa is unable to stand, walk or sit up without support. She is independent in operating a motorized wheelchair to get around school and home. She is dependent for most activities of daily living, such as bathing, grooming, toileting, dressing and transfers. Melissa does minimally assist with transfers to and from her wheelchair by using her upper extremities. She really yearns to be independent and eagerly pursues every opportunity she can to do this. Melissa has good functional use of her upper extremities and can feed herself, use a computer (keyboard and mouse), manipulate an Ipod and TV/Wii remote control, and sort through papers. She loves giving hand massages and lucky recipients report that she is very good! At school, Melissa has the unofficial job of handing out mail and she is becoming very proficient at using a computer in her classroom. Melissa lives in an apartment, in a low-income housing development in the Bronx, with her mother, older sister and younger brother who also has special needs (he is diagnosed with autism). She shares the bedroom with her mother and neither of them would have it any other way. Presently Melissa and her mom share a Queen-sized bed. When asked if they would like separate beds in their new bedroom, they both looked at each other and emphatically said no. They obviously share a deep and nurturing love that benefits both of them. Melissa is extremely excited about her upcoming bedroom transformation, which is scheduled to take place during the weekend of 7/30-7/31. In fact, when we told her that she was next in line for a bedroom makeover, she practically jumped out of her wheelchair giggling and squealing with pure delight. She said in a passionate and loud whisper “I want this so bad!” When asked what she wanted her dream bedroom to look like, Melissa was very certain and it was obvious she had given much thought to it already. She said that she wanted her room to be pink, green and peach and have beautiful, brightly colored flowers with fairies, and a romantic canopy style bed. 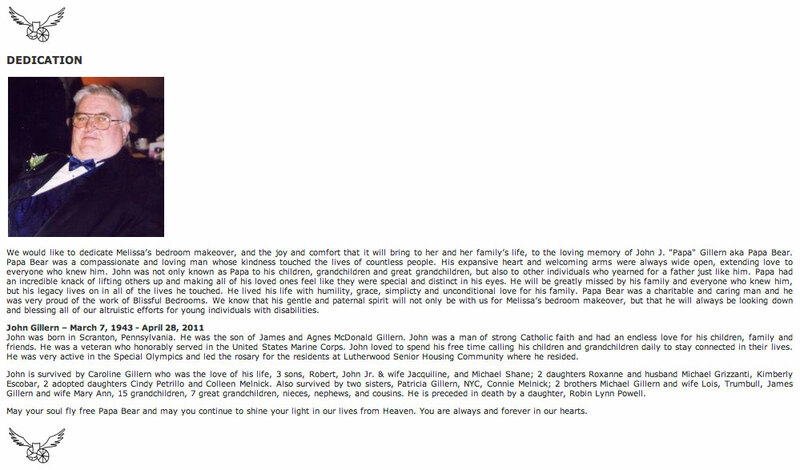 She also made sure we knew that she really wanted a Ipad or computer and a TV. Mom is just as excited and happy as Melissa and is in full agreement with Melissa’s design plans. In her free time, Melissa enjoys listening to Christian music, going to church, watching the The Learning Channel and romantic films such as her favorite movie The Titanic, and using the computer. She is a real girlie-girl and loves wearing pretty clothes, bracelets and other feminine accessoriess. Blissful Bedrooms can’t wait to give Melissa and her adoring mom a beautiful bedroom that they can feel peaceful and happy in for years to come. Please help us give this very special young lady, and her devoted mom, a dreamy, ethereal and magical bedroom by making a donation today. Please take a few moments to view the photos from Melissa's makeover weekend, which include Before & After photos of her bedroom, pictures of the details and art work, her reaction to the Revealing of her bedroom, the process of transforming the bedroom and the Reveal party celebration with Blissful Bedrooms friends and supporters. Alexey Dvoryadkin, the Co-Founder and official photographer of Blissful Bedrooms, did it again! He captured the transcendental beauty of Melissa's spirit in these photographs. The part of Melissa that can fly and dance and twirl around and around. The true Melissa that is free from the confines of her wheelchair, her braces, her complete and total dependence on others for survival. The awesome volunteer photo shoot team transported Melissa to a place where she is free to skip and float and romp joyfully in the lightness of her being. Alex took these beautiful photographs for for all to see, but most importantly for Melissa to see. A selection of these pictures are displayed in her brand new bedroom, so while Melissa dwells on this earth, she will never forget the true essence and beauty of her being. Spread your fairy wings Melissa and illuminate us with your radiant light. You are beautiful and we celebrate you!! On a steamy hot Sunday morning on 7/24/11, a team of Blissful Bedrooms volunteers showed up at Melissa’s home in the Bronx with one shared intention: to make Melissa the center of all of their focus for the next several hours, and to use their talents and compassionate spirits to create a magical and enchanted fantasy world of Melissa’s making. They came toting suitcases filled with camera equipment, colorful flowers, fairy wings, romantic dresses, feminine jewelry, glittery makeup, blow dryers, hair accessories and other items hand picked to help Melissa embody the romantic persona of a Fairy Princess. Melissa had a wonderful time and never stopped smiling. The photographs that were taken capture her charming fairy personality so well, and we were all quite amazed how effortlessly and naturally Melissa was able to transform into her fairy character. 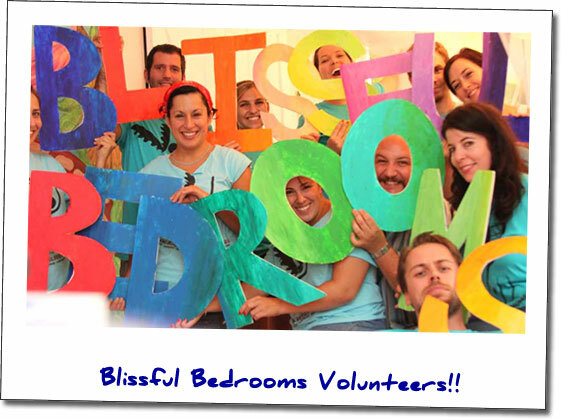 Thank you to all of the talented & dedicated VOLUNTEERS who contributed to Melissa’s bedroom makeover! Thank you to all of the generous ORGANIZATIONS/BUSINESSES and INDIVIDUALS who have supported Melissa’s bedroom makeover by donating funds, services and/or materials. This makeover could not have been possible without your help!